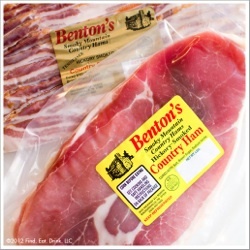 Benton's Smoky Mountain Country Hams - Find. Eat. Drink. Q. So many chefs use your products and we always hear wonderful things about you. What do you think it is that connects so well with people? A. Golly, I really don’t know honestly. We have never advertised. Word of mouth is all we’ve ever had. We have had some great publicity. I owe a debt of gratitude to every chef that uses this product. Q. What’s the secret sauce that makes it so different? A. We try to start out with the very best fresh product that we can get our hands on. Most of the pork we buy is grown on pasture, no antibiotics. A lot of the hams that are made today, they make in 80 days. Well that’s not my game, I have hams in my building now that are 28 months old. We set a goal for ourselves, many years ago, that we wanted to make a world class product, that would compete with the Europeans. I sure won’t pretend that we reached that goal, but I can tell you we strive to meet it everyday in our business. Q. How would you describe your product? Q. Who was the first chef who bought from you? A. The very first chef was Bob Carter, who was at Blackberry Farms. He left after about a year [now at Peninsula Grill in Charleston] and John Fleer became the chef. People kept telling him that he needed to order some stuff from me. My customer base was just pretty much a few greasy spoon restaurants, scattered throughout the Smokies and the local hillbillies that just walked in my front door. Well, he wanted to tell me that he had been playing around with my products extensively and wanted to develop a menu around them, and if it was okay if he put my name on the menu. Nobody had ever put my name on a menu. I kind of remember saying ‘well, I guess if you want to do that, it’s okay,’ because I didn’t know what he meant. My marketing skills are pathetic! Q. How did other chefs find out about you? A. John Fleer singlehandedly started sharing my products with all these incredible chefs, everybody from Thomas Keller on the West Coast to Tom Colicchio in New York to John Besh in New Orleans. They had all these fabulous chefs across the country come to Blackberry Farm as guest chefs and he invariably shared my products with them. Q. Have you had the chance to have your bacon prepared in a lot of the restaurants around the country? A. I have. It’s honestly the creativity of these very talented chefs that’s made my product. I think what I make is a decent product, it’s not a fabulous product, but they take it and elevate it. Q. What are some interesting takes on it that stand out in your mind? A. Chef John Fleer served my bacon wrapped around sturgeon, that he had imported from the Northwest, and I was amazed at how delicious it was. He served me shrimp as an appetizer that was wrapped in my country variety prosciutto and I was totally blown away. One of the most memorable experiences was at Craft Restaurant in New York City. Damon Wise, the executive chef for Tom Colicchio, served me scallops in a bacon consume. And when I close my eyes. I can still remember the texture and the flavor of that product. It was one of those epiphany moments that was absolutely delicious. Chef Sean Brock, at McCrady’s in Charleston, served me bacon cotton candy. Sean is a wild man. Chef David Chang does so much with our products that is absolutely great. At PDT, I had the Benton’s Old Fashioned. They infuse that bourbon with our smoked bacon, the grease of that bacon and it’s pretty incredible. When I first heard about it, I was skeptical, but when I had it, it changed my mind. It's a great drink. It’s the creativity of that great mixologist Jim Meehan. Q. Sounds like you really love what you do for a living. A. I’ve been blessed to make a living doing something that I really enjoy and I kind of got into it just as a lark. I was a high school guidance counselor, I had just gotten my master’s degree, and they showed me the salary schedule and I realized that I might have made a poor career choice! I resigned from my job and I heard that this fellow in our community, Albert Hicks, who had started our business in 1947 and ran it in a tiny little shack behind his house, had quit the business and I went over and I leased that old building from him and I started making ham and bacon right in his backyard. I honestly count my blessings everyday that I’m still doing this, because I really enjoy what I do and I get to meet this incredible cross-section of humanity. I’m dealing with farmers in their bibbed overalls, five star chefs and all kinds of people in-between. I’m old enough to draw social security, but I have zero plans of retiring. I hope that if I’m alive and able, that I’ll be making bacon when I’m 85! You’re not going to get rich in the meat business, but if someone offered me ten times as much doing something else, I’m not sure I’d want to do that. Allan Benton’s recommendations for restaurants, ham, bourbon, beer, and cookbooks. Allan Benton, owner of Benton’s Smoky Mountain Country Hams. Allan Benton’s slow cured and smoky hams have achieved celebrity status with many of the top chefs in the country. They love his products so much, they specify on their menus that they are using Benton’s. - Cookbook Authors: The Lee Bros. There are a lot of people in our industry who are doing a good job. Sam Edwards is doing a fabulous job with his Virginia Country Hams. Nancy Newsom also does a great job. 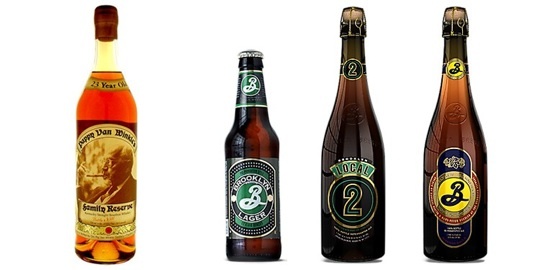 Details of Allan Benton’s recommendations for restaurants, ham, bourbon, beer, and cookbooks. My wife has a passion for cookbooks. We have so many. I met Peter when we were on a panel together. He pointed out how important it was to find these older breeds of hogs, not the modern stuff, but the old traditional breeds -- like Berkshire and Duroc. He said they need to be raised on pasture, no antibiotics. I bit hook, line and sinker. Down in Mississippi, writes a syndicated column for some newspapers and he owns some restaurants. I think I have just about every cookbook he’s done, they are entertaining, they are practical and they are wonderful. I also really like their collection of cookbooks. One of my favorite local places. Fabulous barbecue. It’s between Bristol and Johnson City. They have a cult following and it’s always busy. Some of the waitresses who work there are stereotypes, these gals have been there, some of them for 40 years, and look like they’ve eaten that stuff way too many times! We used to only have chain restaurants, now there’s this restaurant in Maryville. I’m a sucker for their short ribs and the lamb chops. The also have great seafood items. Their desserts may be the best desserts on earth. It’s a husband and wife team and she’s the baker and does an incredible job. In Knoxville, Tennessee, the chef’s Bruce Bogartz. 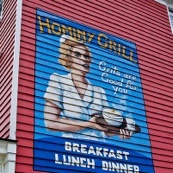 It’s a great restaurant. I like everything, but I really like his great appetizers. He does an incredible job with his chicken livers and mussels, though I may be biased, since I think he flavors it with some of my smoked bacon. Also in Knoxville, it’s a great little restaurant. I like a lot of the pasta dishes that they serve. A chain of two sandwich restaurants, one in Knoxville and one in Maryville. Everything is fresh and organic and the quality is unbelievable. It’s one of my favorite places to have lunch. You just don’t improve upon it. I’m going to tell you Blackberry Farm has got to be one of the best places, without a doubt. It was the most incredible culinary experience of my life going to New York. The wonderful part of going up there is that I was with John T. Edge. Traveling with him, in the culinary world, is like traveling with Mick Jagger! They make wonderful sausages and charcuterie items and have a restaurant next door. They did an amazing job. I went to this hole in the wall place over on First Avenue called Momofuku (laughs). I thought I had actually gone to heaven. That pork bun that he does over there. One of the most memorable meals of my life had to be the meal at Craft. I’ve had three or four meals that stand out in my mind as the best meals I’ve ever had, and that meal at Craft has to be one of them. I was never a bourbon drinker until I tasted Pappy Van Winkle the first time. It’s my favorite. I love Julian’s Rye Whiskey and their 20 Year Old bourbon. I love his beer. He is a magician! Once I had his beer, it blew me away. It was like I had never had beer before! It may be my favorite beer on this earth. He made a smoked beer and he told me to pair it with some of my bacon to make it work. I didn’t listen to him and I tasted it with olives and didn’t like it. The next time, I did what Garrett suggested and had it with some of my smoked bacon and flipped out. He’s incredibly talented. I’ve never met him, but I’m a huge fan of his. Benton’s Family Cure video by Jennifer Davick.